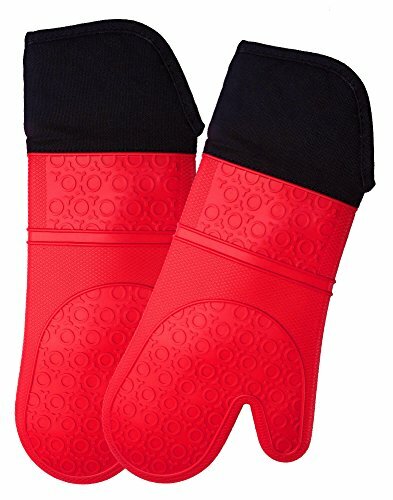 HOMWE Professional Silicone Oven Mitts give you extra protection from burns and scalds during all of your cooking activities. At 14.7" inches long, and boasting a soft, quilted liner, the HOMWE Silicone Mitts prevent steam scalds while cooking on the stovetop or draining boiled pasta. Our mitts are heat-resistant to 450 degrees Fahrenheit so they will also spare tender forearms from burns that can occur when your outdoor grill experiences a flare-up. Our commercial-grade silicone oven mitts are ideal for all of your baking, grilling and cooking needs. Kitchen & Grill Versatility - HOMWE kitchen cooking gloves helps protect hands while holding hot plates and dishware, working over the grill or reaching into ovens. Textured, Non-Slip Grip - These silicone oven mitts are flexible, breathable and provide an improved control and stability thanks to a non-skid, textured palm. Superior Safety Length - With two lengths available (13.7" and 14.7"), our heat-resistant cooking gloves better protect fingers, hands and wrists from burns. Heavy-Duty, Heat-Resistant Silicone - Offering protection up to 450°F, our oven gloves with quilted cotton lining offer improved comfort while cooking and grilling. Unmatched Quality Assurance - Crafted with FDA-approved, BPA-free silicone, our silicone gloves for cooking and grill use are backed by a 100% satisfaction guarantee.